Home / Backhealth blog / Migraine headaches, new insights. Their is no one magic bullet cure/approach to migraine headaches. Your body is a complicated system and migraines are a complicated diagnosis. Thankfully their is also a large amount of internal intelligence built into the human body, which tends to push function towards normal. However when your in the middle of a full blown migraine attack you won’t think their is much intelligence involved. But its there, and you usually only have to fix a percentage of the ‘dysfunctional’ weak links in the migraine chain for things to improve. You have probably already addressed a few by yourself over the years. In this blog I will mainly address the spinal/structural weak links in the migraine chain. This is an incredibly important one, and if it hasn’t been addressed to date this is exciting, because their is a potential for some good relief available. One interesting area of resent research is with atlas vertebrae mis-alignments. This can cause a compression of the internal jugular vein (IJV) against the styloid process. Mandolesi S et al, Ann Ital Chir 2015 May-Jun;86(3):192-200 This potentially causes a backup of old de-oxygenated and glucose depleted blood, back up into the brain on that side. This negatively affects the vascular system up into the brain, and raises the importance of correcting abnormal upper neck function. 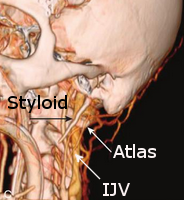 This shows the IJV being compressed between the atlas vertebrae and the styloid process. 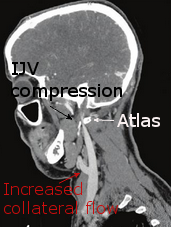 This is a CT examination of the atlas mis-alignment compressing the IJV as described above. This shows the a higher percentage of increased secondary venous drainage (collateral flow) in Migraine patients, accompanied by and lower jugular flow when compared to controls. Koerte et al. Invest Radiol. 2011 Jul;46(7):434-40. (B and D are the migraine group, which shows reduced internal jugular flow (blue line), and increased collateral circulation (purple line). This is highly suggestive of internal jugular compression, for which, atlas mis-alignment is a major cause. Migraine headaches are different to tension or spinal type headaches. There is a much bigger vascular component to them and genetic factors are more important, stress factors less important. In fact migraine sufferers tend to be what we call parasympathetic dominant, which is the opposite of stress (which is sympathetic dominant). You probably vaguely remember from high school biology that the autonomic nervous system – the part of our nervous system not under our conscious control – is broken up into two parts, mirror images of each other: the sympathetic and the parasympathetic nervous system. One basically increases function, the other decreases it. The balance between the two is usually an inheritable trait of your nerve system, and while it can be modified, more directs how you treat the spine. Migraine sufferers can however show a stress response at certain stages of an attack. One thing that is quite helpful is a heart rate variability test. This gives us an indication of whether you are actually stressed (sympathetic dominant), and have a stress or tension headache, or (parasympathetic dominant) and more likely to be a true migraine headache. If the person is parasympathetic dominant manipulative (clicking) adjusting isn’t usually as helpful (while we are improving the spinal alignment and movement, we end up over stimulating the parasympathetics further), and I usually adjust them with gentle instrument adjusting. If they are sympathetic dominant, this latter consideration isn’t an issue and a gentle manipulative style is usually preferred. The key point, is making sure the right specific technique is used for the particular persons nerve system and spinal alignment. Aside from pain/comfort considerations, everything needs to be explored to reduce the frequency and severity of the migraines because it has been shown that they can negatively affect the brain over time. 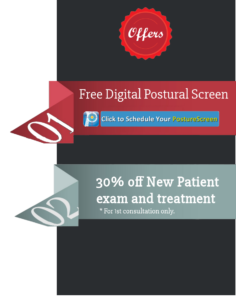 In summation no approach is a guaranteed cure-all, the main point of the adjusting is to improve the spinal and structural components of the body in a way that is helpful in reducing the migraines. A trial approach is often suggested, giving enough time to see improvement. 22% of participants reported more than a 90% reduction of migraines as a consequence of the 2 months of SMT. Approximately 50% more participants reported significant improvement in the severity of each episode. “Journal of manipulative and physiological therapeutics.”J Manipulative Physiol Ther. 2000 Feb;23(2):91-5. SMT appears to have a better effect than massage for cervicogenic headache. It also appears that SMT has an effect comparable to commonly used first-line prophylactic prescription medications for tension-type headache and migraine headache. Efficacy of spinal manipulation for chronic headache: a systematic review. Bronfort et al. J Manipulative Physiol Ther. 2001 Sep;24(7):457-66. The reduction in headache index scores during treatment compared with baseline was 49% for amitriptyline, 40% for spinal manipulation. During the post treatment follow-up period the reduction from baseline was 24% for amitriptyline, 42% for Chiropractic adjusting (57% more effective than amitriptyline). The efficacy of spinal manipulation, amitriptyline and the combination of both therapies for the prophylaxis of migraine headache. 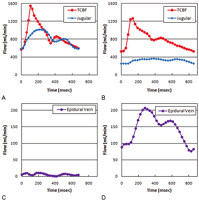 Nelson C et al, J Manipulative Physiol Ther. 1998 Oct;21(8):511-9. The initial 32 participants showed statistically significant (p < 0.05) improvement in migraine frequency, VAS, disability, and medication use, when compared to initial baseline levels. A twelve month clinical trial of chiropractic spinal manipulative therapy for migraine. Tuchin et al. 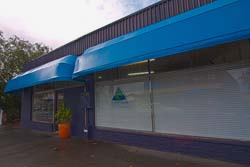 Australas Chiropr Osteopathy. 1999 Jul;8(2):61-5.